Come on! Do your bit to get the mighty Triumph TR7 in the press - Malcolm Paris (TR7 Registrar for the TR Register Club) made an impassioned plea for enthusiasts to contact the classic car press, and we took that on by trying to cover TR7 appearances in the classic mags... whilst imploring you to start hitting the editors (quite literally) with sackfuls of virtual mail. So what's happening? Well Classics Monthly (sister publication of TR7 love-in brothers Retro Cars) featured a 3 page spread of a couple owning both an early 5spd fixed and a late model auto DHC. This is in the August 2006 edition (see cover, left). 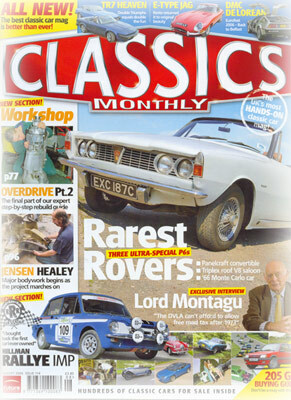 If you've not seen a copy get your e-mail to classics@subscription.co.uk or call them +44 (0) 870 837 4773, the mag costs £3.85 with postage varying from £2 to £4. The magazine is similar to Retro Cars in that vehicle usage is to the for, it's down to earth with a broad outlook on affordable classics - the style is entertaining and the target audience is probably the younger enthusiast! We like it anyway! But it looks like a bumper time for the wedge in the press just at the moment. 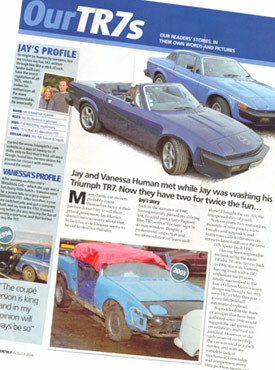 Two Triumph TR7's is problematic enough but back in their July 2006 edition Classics & Sports Car features some of the cars belonging to TR7 collectomaniac Chris Turner, in comparing a standard 2.0l against the Sprint and v8 variants of the wedge. At last count Chris had more TR7s than were actually left on the road, a fantastic achievment in itself... in fact it's worth checking the deeds on your car as you may find that it actually belongs to Chris too! The article is very objective in comparing the cars, the writer seems to favour the Sprint powered car above the others. Other than the superb main picture though I can't help but think they missed a trick. Chris's cars (including the Sprint recently belonging to and rebuilt by John Gibson) look superb and yet the photo's don't really do them justice. 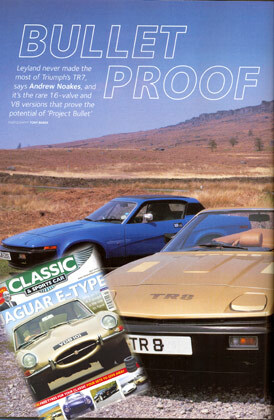 That said it's a worthy article to add to your Triumph TR7 media collection - the magazine itself is aimed toward the top end of the market and the numerous adverts for the more exotic classic car can get on your nerves (well they got on mine at any rate). But that's not the end of it!! 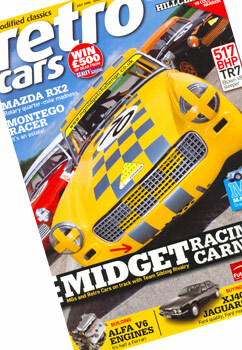 Playing up to its role as odalisque to the TR7 Retro Cars (July 2006) once again features a heavily modified wedge. And yes, once again the Triumph TR7 has had a v8 slapped in... only this time Danny Galliver extracts a monstrous 517 horses from turbo charged Rover lump. Oh did we mention that those horses are at the wheels? That would scare those scooby boys a little me thinks. So if you are thinking of getting serious it may be worth picking the magazine up, there's enough pointers in there to get you started. It was good to see a none UK car for a change (Danny Galliver is from Australia), so now we need to hear from you guys (n girls) in other parts of the world. If there's any press coverage anywhere we want to know about it (even if we can't understand it), so let us know and we'll try and cover them in these pages. So what are you waiting for? Get writing to the editors, get you car in the press, go on it's a dare! The round up from April/May 2006 is still online if you wish to see what you've missed previously.